Security camera image quality is not as simple as people think. Most think that as long as a security camera systems box reads ‘720P HD’ or ‘1080P HD’ that they are buying a quality product. This is not the case. Actually, security cameras by MOBOTIX surpassed 1080P resolution about 8 years ago so 1080P is dated. Do not be fooled by the ‘1080P HD’ marketing trick! Resolution is only the first part of the image processing chain. Security camera image quality depends on 4 key components and MOBOTIX has given special attention to each. We give you a lot of information here because we believe it is important to reveal as much as possible about the products we believe in so that you can too. A video series on this topic is found at the bottom of this article. MOBOTIX security cameras record in up to 6 MegaPixel (6 million pixels) resolution. 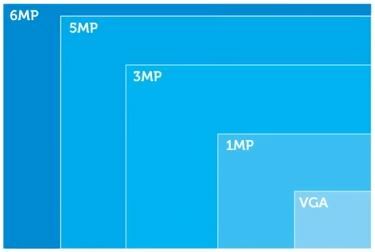 1080P is equal to 2MegaPixel (2 million pixels). With 3 times the amount of pixels, your digital zooming will reveal more detail than 1080P. It is important to understand the differences in fixed lenses and vari-focal lenses when consider security camera image quality. MOBOTIX opted for the fixed lens because there are no moving parts and there are less layers of glass for light to travel through. The no moving parts aspect keeps the failure rate much lower in comparison to a mechanical vari-focal lens. Also, a vari-focal lens has more layers of glass for light to travel through so less of it makes it to the image sensor. The MOBOTIX 6 MegaPixel platform provides enough pixels so that you may zoom digitally instead of mechanically and still maintain superb image quality. A fixed lens has less layers of glass allowing more light through to the image sensor. The size, grade and capability of the image sensor impacts security camera image quality. It doesn’t matter how high the resolution or lens quality is if the camera has an undersized image sensor. 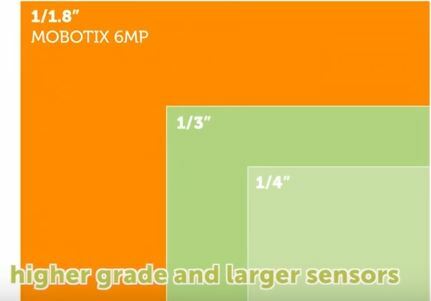 MOBOTIX uses what would be considered an over-sized image sensor. Most iP camera vendors are using 1/4″ or 1/3″ sized image sensors while MOBOTIX uses 1 and 1/8″ image sensors. MOBOTIX security camera image sensors are over-sized in order to capture more light and movement. Security camera image quality will suffer greatly if the video codec being used is insufficient, even with high resolution, a nice fixed lens, and large high quality sensors. The H264 codec was first created in order to make Hollywood movie file sizes the perfect size for fitting on to a DVD or for streaming online. What happens is the H264 codec will average out a lot of detail because it knows you are watching at 30 frames per second. The average out detail is crucial in a surveillance environment where going frame by frame to in search of evidence. On average, H264 will only preserve 1 of every 5 full frames of detail, whereas MxPEG retains every piece of information from every frame. MOBOTIX created the MxPEG codec specifically for surveillance while all other manufacturers still use H264, the Hollywood movie codec. Which would you prefer? H264 captures 1 of every 5 full frames. MOBOTIX MxPEG captures every full frame. We have more information available about security camera motion blur here on our site. You can also take a look at the study done on using MPEG/H264 codecs in a security environment. The study was done by someone within the MPEG/H264 community and is explicitly states that using H264 in a sensitive surveillance situation is not recommended.